If you need a 120" to 150" ultra short throw solution for conference room or classroom, make sure to take a look at the new Vivitek DH765Z-UST. This is a rare beast on the market, combining ultra short throw, native 1920x1080 resolution, and a laser-driven light engine with up to 20,000 hours of life. An optional accessory called the NovoPro ($799) expands connectivity by allowing up to 64 participants, making it truly unique. Throw in its industry leading 5 year warranty, and it is a lot of projector for an official street of $2,999. Like all UST projectors, the DH765Z has upper and lower limits on image size beyond which it cannot focus clearly. Though it is designed for large screen use and can go up to 150" diagonal, it can also go down as small as 80" as per specs. Actually, our test unit produced sharply focused images about 5% smaller and larger than those official specifications. Digital signage is another good use for the DH765Z. Because it can be placed so close to a screen, large signage can be displayed in a small enclosure. To increase functionality for signage use, Vivitek offers an option called the NovoDS ($499) which stores up to 6GB of video, photo, and/or data files. Data images on the DH765Z showed a lot of pop and contrast. The projector delivers excellent image sharpness from edge to edge within the window of its image size specs. Accordingly, the resolution and alphanumeric characters and graphical elements are exceptionally readable while using small fonts, even with full keystone correction applied if that should become necessary. Photos looked especially good in Presentation mode where color accuracy was a bit better than Bright mode. Like most DLP projectors, the DH765Z has a Brilliant Color feature which enables you to find the right trade-off between image brightness and color saturation/fidelity for your particular use. The control allows settings from 1 to 10, with 10 being maximum brightness for full ambient light use. In low to medium ambient light conditions, color quality was enhanced by reducing the Brilliant Color setting. At 6, contrast was excellent and, while highlights were a bit subdued, black levels were very good and overall picture quality was optimized for lower light viewing. There was a slight greenish tinge in the factory default video modes, but it was easily suppressed in the color adjustment menu without materially affecting brightness levels. Technically, the best video quality in terms of contrast and saturation is achieved by turning Brilliant Color off. However, this drops the lumen output by over 50%. From a practical perspective, users might want to experiment with a trade-off that sets Brilliant Color in a medium setting that boost brightness somewhat without compromising color saturation all that much. Though it is always true that projected video looks best in a dark viewing room, it is particularly true of this projector since lumen output in it optimized video modes will tend to be quite a bit lower than what you might expect from the 3500 lumen rating. On the other hand, when viewed in a dark room in its optimum video configurations, contrast and black levels are solid and the video quality overall is thoroughly engaging. Color Brightness. In all color modes with Brilliant Color set at its maximum, the DH765Z's color brightness was about 43% of its white brightness which is not unusual for a DLP projector configured for commercial data presentation. As the Brilliant Color setting is reduced, the color percentage in the picture rises as you'd expect, and color saturation improves. If you are viewing in a dark room and you don't need the white boost from Brilliant Color, you can turn it off to achieve maximum color saturation and fidelity. But even with Brilliant Color set to its medium positions, color saturation and image balance is visually solid, so you may opt for medium settings even in a dark viewing environment in order to maximize screen image size. Eco Mode. Although fan noise is already low in Normal mode, Eco mode lowers it to a whisper with only a 20% reduction in brightness. There is no indication that Eco mode extends illumination system life, so we would recommend using Normal mode since fan noise is not distracting. Brightness uniformity. Brightness uniformity measured 72% which is typical for many UST and better than some. Moreover, the uneven illumination is gradual and barely noticeable even on a static data presentation, with no hotspots or exceptional dimming in any area of the screen. It is undetectable with video content since, subjectively, the viewer usually has no idea how relatively bright various areas of the image should be. Fan noise. The DH765Z's fan noise is modest in Normal mode and consists of low and medium frequencies that are not distracting. In Eco mode, fan noise drops substantially. Since the DH765Z is positioned close to the screen and heat is exhausted from the side of the projector, it is unlikely that fan noise in any illumination mode will be an issue. Input Lag. The measured lag time is 49 ms in all modes. Lamp Life. The rating for the laser light engine is 20,000 hours. 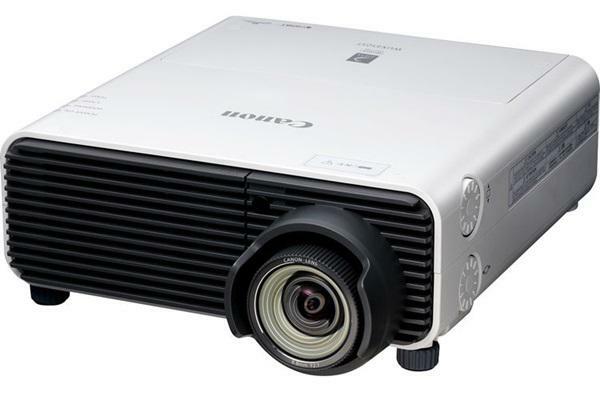 You will probably be upgrading to the next generation projector long before the DH765Z's illumination system gives out. Warranty. Vivitek warrants the projector for 5 years. 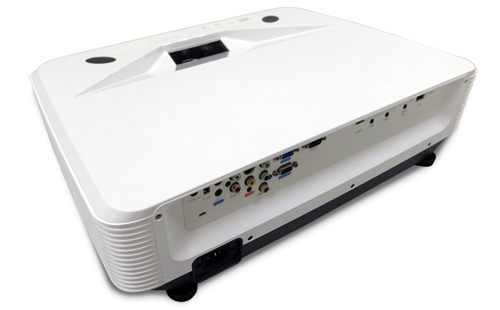 All UST projectors require a perfectly flat screen surface -- any warping or waves in the screen will show up in aggravated fashion when illuminated from the aggressive angle of a UST projector. So cheap pop-up screens or flimsy pull-downs that do not have sufficient tab-tension to keep the screen flat are not advised. Since the DH765Z is intended for conference and classroom use, there will typically be some ambient light in the room. The DH765Z's picture will have significantly improved contrast and sizzle when paired with an Ambient Light Rejection (ALR) screen designed specifically for use with UST projectors. However, these can be expensive, running up to $6,000 for a 120" screen depending on the brand you buy, which is more than most would be willing to pay for a screen to match with a $3,000 projector. For this reason we test ultra short throw projectors like the DH765Z with the Viewsonic BCP120 ALR screen which is designed for use with UST projectors. This aggressively priced ALR screen sells for only $1,599 on Amazon in its 120" size, so from a price perspective it is a cost-effective match with the DH765Z. There is also a 100" version, the ViewSonic BCP100 for $1,199 on Amazon and may be the better option if you are going to run in full room light most of the time. These ViewSonic fixed frame screens are rigid enough to deliver the perfectly flat surface required for successful UST installations. Another important consideration is to orient the projector perpendicular to the screen. Any vertical or horizontal offset from center will cause significant image keystoning. If necessary, the DH765Z offer various types of electronic keystone correction, but the scaling disturbs the ability to match a 1080p signal one-to-one with the pixel matrix of the chip. So you might want to avoid keystone adjustments if possible. Image Size. Image size can only be changed by moving the DH765Z closer to or farther from the screen. There is a Digital Zoom control available, but it is used for increasing a portion of the image for closer inspection. Throw Distance. At the minimum image size (80"), the front edge of the DH765Z is about 1 5/8" from the screen. At maximum image size (150"), the case is approximately 16 1/4" from the screen. Video best in dark room. Though it is always true that projected video looks best in a dark viewing room, it is particularly true of this projector since lumen output in it optimized video modes is significantly lower than spec. Audio. The DH765Z's built-in 10-watt speaker may be adequate for a small room; it is buzz- and rattle-free over its entire range. However in most cases we suspect an external speaker system would be desired for an enjoyable viewing and listening experience. Rainbow artifacts. Rainbow artifacts are a non-issue for data presentations, so they are largely irrelevant for most anticipated uses of the DH765Z. For dedicated video use, some users may see occasional rainbows, but they are not bright enough or frequent enough to be distracting to anyone but the most hypersensitive viewer. Since the DH765Z will normally be used in ambient light, an Ambient Light Rejection screen designed for use with UST projectors is strongly advised. This will increase the pop and contrast of the image. For the presentation of Word docs and Excel spreadsheets, setting BrilliantColor to 10 will maximize the punch of the image on screen. For full color graphics, photos, or video, reducing BrilliantColor to medium settings will likely deliver more satisfying results in terms of color saturation. In short, the DH765Z-UST is a cost-effective alternative to flat panel monitors. It gives you a far larger image than you'd get with a flat panel with the same convenience and long term maintenance free operation. Highly recommended for conference and classroom installations.